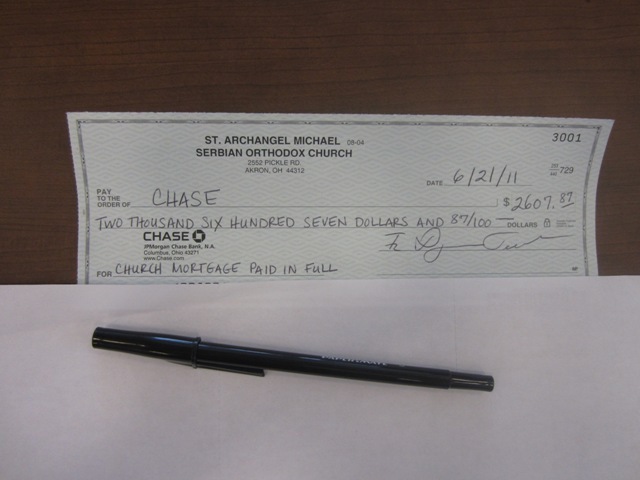 Akron, OH - The St. Archangel Michael Serbian Orthodox Church of Akron, Ohio, is thrilled to announce that their parish paid off their Church Mortgage on Tuesday, June 21, 2011. A day long-awaited finally arrived! We thank everyone who has generously donated and selflessly worked to accomplish this goal. A very special thank you must be noted to His Grace, the Right Reverend Bishop Dr. +Mitrophan, and the Eastern Diocese for their support in our time of need! A celebration mortgage-burning banquet is being planned for sometime in September. Also, please join our parish for our annual Serbian Festival July 30th-31st. For more information see our Facebook page at SERB FEST Akron or our website. Glory and thanksgiving be to our Lord and Savior Jesus Christ for all His abundant, bountiful, and endless blessings!